The male of this nocturnal species has spectacular, pale-tipped tail streamers that float behind its body while flying. Both male and female have a cryptic plumage blending perfectly into their environment. However, the female has much shorter tail. The loud calls given at dusk reveal their presence as they start to forage in the darkness. The Lyre-tailed Nightjar is slightly paler than the Scissor-tailed Nightjar, and the male has darker and much larger tail. This is really an amazing South-American Caprimulgidae species! Male and female have similar plumage with brown upperparts, heavily spotted pale grey, buff, tawny and cinnamon. There is a conspicuous rufous nuchal collar. The wing-coverts are brown too, spotted tawny and buff. On the underparts, we can see a narrow, pale buff collar on the lower throat. The underparts are brown, barred and spotted tawny, buff and cinnamon. Flanks and lower belly are mostly buff barred brown. There are no white markings on the wings. The head shows the same cryptic colours with greyish crown slightly streaked black. The bill is blackish with the base surrounded by stiff rictal bristles. The eyes are brown, but by night, the car headlights are reflected red from the bird’s eyes. Legs and feet are brownish. Both sexes are similar, but the male has elongated outermost rectrices with white tips, whereas the female lacks them. The juvenile is not described. 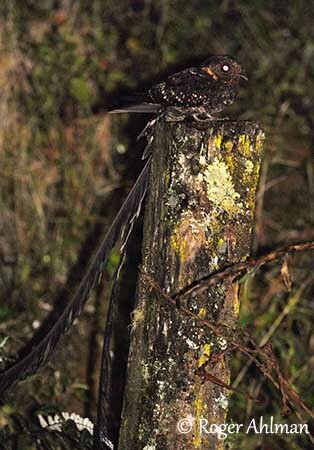 The Lyre-tailed Nightjar has three subspecies. U.l. lyra (here described) is found in the Andes, in W Venezuela, W Colombia and Ecuador. U.l. peruana occurs on the E slope of the Andes, from Peru (Amazonas) S to C Bolivia (W Santa Cruz). This race is reddish in coloration. U.l. argentina is found in the Andes in N Argentina, and possibly in S Bolivia. This one has whiter markings on the breast. The male’s streamers are tipped greyish, not white. 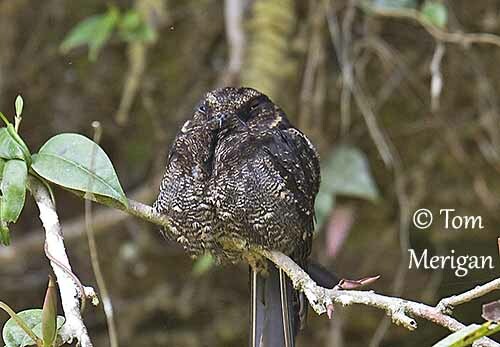 The Lyre-tailed Nightjar frequents the humid and wet montane forest. It can be seen in clearings and openings along the edges of the forest. This species often occurs near cliffs and rocky ravines, or at cave entrances were it roosts during the day. It may also frequent open woodland near water. This species is visible between 800 and 3500 metres of elevation. The Lyre-tailed Nightjar male’s advertising call is a melodious series of several rolling “wéeoo-tee” notes. Each note is higher-pitched and louder than the preceding one. During the aerial displays, it gives rapid “weep weep weep weepupup” notes. While perched or in flight, it utters a rapid “chip-chip-chip”. When the bird is alarmed or threatened, it gives a loud, guttural hissing sound, rising slowly in pitch and volume as the huge gape is widely opened. 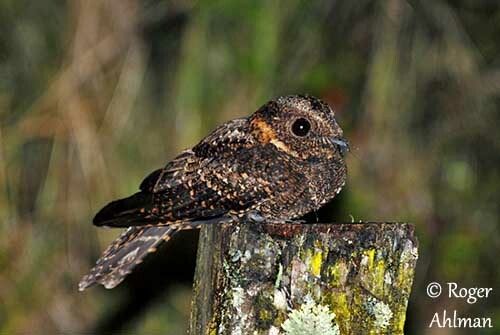 The Lyre-tailed Nightjar is an insect-eater. It performs short sallies from perch or occasionally from the ground too. It feeds mainly on winged-insects often caught and swallowed while flying. In flight, the bird keeps its large gaping mouth open as it flies through swarms of flying insects attracted by the light of the street lamps such as mosquitoes, flies, beetles, winged ants, moths and it also takes grasshoppers. During the breeding season, the Lyre-tailed Nightjar performs beautiful aerial displays at night. These flight displays occur at communal aerial lek where one or several males circle and call at, or chase one or several females that join them. The males hover and flick their elongated rectrices to and fro. 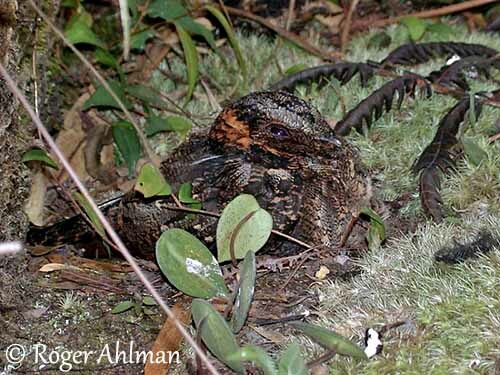 The Lyre-tailed Nightjar is territorial. It sings to keep other males away and to attract a female. The male defends strongly the territory by singing towards another singing male. They may sometimes adopt aggressive postures with drooped wings and the tail fanned or raising into the air. Physical contact may occur sometimes between two males flying at each other, hitting out with the wings and grappling their bills. Both birds can sometimes fall together to the ground before they go their own ways. The Lyre-tailed Nightjar is sedentary in its range. During the day, they roost on the ground protected by their cryptic plumage, or perched crosswise on a branch. The breeding season occurs in June-August and December in Colombia, but it may vary according to the range. 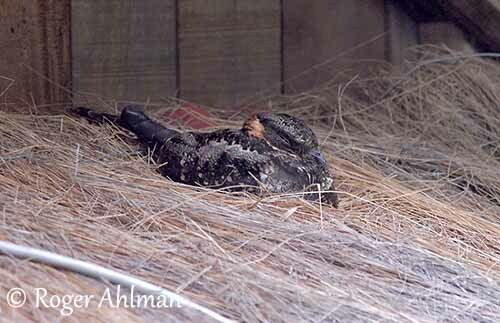 The Lyre-tailed Nightjar does not build a nest. The eggs are laid directly on the ground covered with dead leaves. The female lays 1-2 creamy-white eggs with dark spots and blotches. Both parents share the incubation during 19-21 days. The female usually incubates by day, and during the night, both sexes take turns. At hatching, the chicks are covered with down. Within one day, they are able to perform short-distance movements on the ground. At nest, they are guarded and defended by the male. The contact between adults and chicks is a soft clucking sound. The chicks are fed by their parents by regurgitation of insects. They are brooded until they fledge, about three weeks after hatching. This species can produce a second clutch in good conditions, and the male care for the young while the female lays and incubates the new eggs. The adults sometimes perform distraction displays to lead intruders and predators away from the nest. 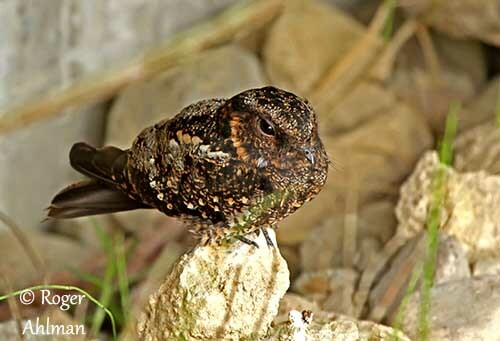 The Lyre-tailed Nightjar has large range where it is local to uncommon. These birds are more often heard than seen, due to their nocturnal behaviour and cryptic colours. The population size is unknown, but suspected to be stable in absence of declines or substantial threats. 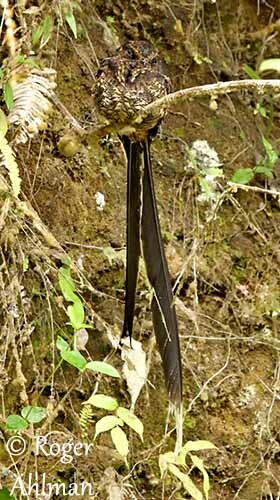 The Lyre-tailed Nightjar is currently evaluated as Least Concern.